The storms will likely start in the mountains and move toward the coast in the afternoon. Tuesday’s forecast has changed a bit. A cold front has speeded up and it looks as though it will move through during the afternoon. This means three things: We’ll have more clouds, it may not be as warm as first forecast, and showers/storms will fire in the afternoon. 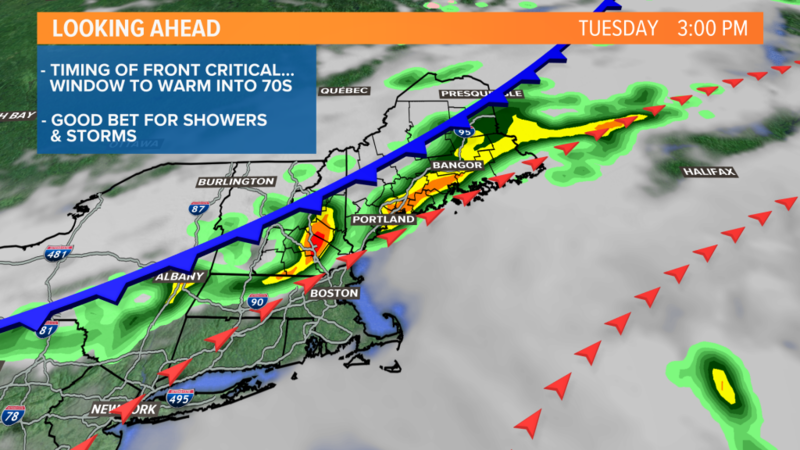 By far, the highest severe weather threat is to our south, from Pennsylvania into Connecticut and western Massachusetts. Low clouds and fog will be around Tuesday morning, especially near the coast. We’ll see some partial sun, which should boost temperatures into the 70s inland by midday. It’ll feel a bit humid, too. Showers and downpours will fire up during the middle of the day in the mountains. Some of the storms may grow strong in New Hampshire and western Maine, where warmer and more humid air moves in. 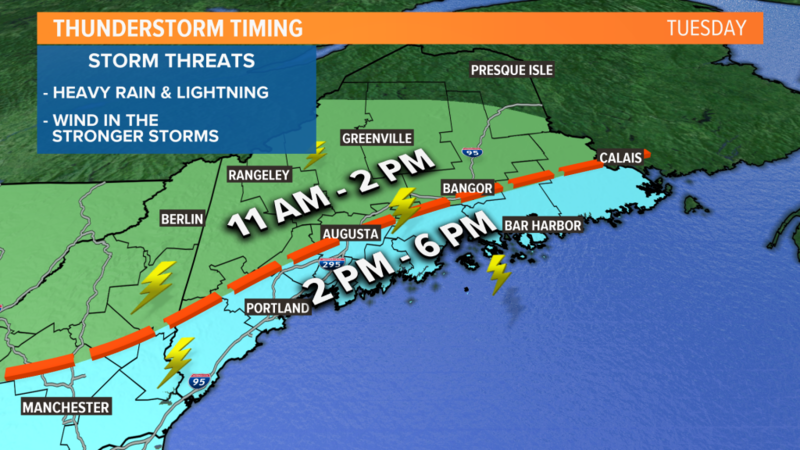 The storms will move closer to the coast as the afternoon progresses, between 2 and 6 p.m. Heavy rain and lightning will be common. The stronger storms may pack a punch, with gusty winds as well. Predicting the exact time and location where these storms will develop is very difficult, so follow our updates overnight and Tuesday morning. If you have outdoor plans Tuesday afternoon, be ready to move inside if a downpour or storm rolls through.